This year’s Ulsan Grand Park Light Festival features five different themes under “Draw the Light Dream” until Jan. 27. 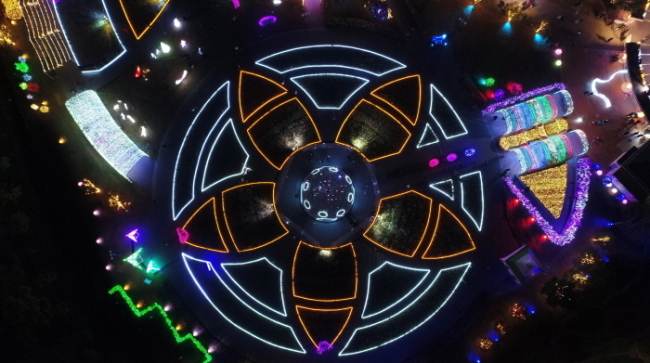 The highlight of the festival is the 11-meter star structure in front of the Rose Garden Fountain, where a multimedia light show is displayed. Admission fees are 2,000 won for adults, 1,000 won for teenagers and 500 won for children. Senior citizens 65 years old and above can enter for free, upon presentation of an ID. It is open to visitors of all ages, with tickets sold on-site. For more information in Korean and English, visit ulsanpark.com. The Chilgapsan Ice Fountain Festival features a large-scale ice fountain that resembles an Alps castle with fairy-tale characters. The festival includes snow sculptures, ice sculptures, a snow cave, a wish tunnel and activities like catching smelt, making organic cosmetics, snow sledding and bobsleighing. The event continues until Feb. 17, and is open between 9 a.m. and 5 p.m., and 6 p.m. and 10 p.m.
For more information in Korean, English, Japanese and Chinese, call the travel hotline at 1330. The homepage (www.alpsvill.com) is only available in Korean. 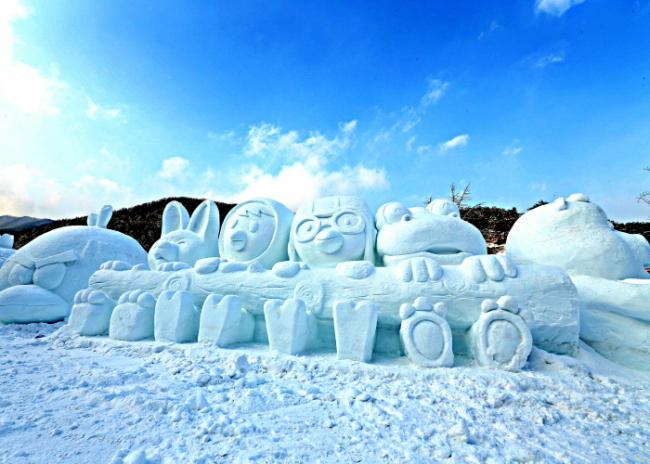 Taebaeksan Mountain Snow Festival presents large-scale snow sculptures in the national park Jungang-ro, Hwangji Pond and other downtown areas. It also offers programs such as the Taebaeksan Mountain Snowflake Hiking Competition, the Igloo Cafe, snow sliding and a starlight festival. The hours are between 11:30 a.m. and 3:30 p.m., only on weekends during the festival period, which continues through Feb. 3. There are no admission fees. For more information in Korean, English, Japanese and Chinese, call the travel hotline at 1330. The homepage (festival.taebaek.go.kr) is only available in Korean. The Yangpyeong Icefish Festival takes place at the Baekdong fishing site and Soomy Village from late-December to early-February. Residents welcome all visitors, including families, couples and groups. Fish cake and roasted chestnuts are offered at the festival. Besides ice fishing, other traditional winter games and activities, such as kite-flying, top spinning, sledding and the making of jjinmbbang (steamed buns with red bean filling), are available. The festival is being held through Feb. 17, and admission fees vary by program. For more information in Korean, English, Japanese and Chinese, call the travel hotline at 1330. The homepage (winterfestival.kr) is only available in Korean. 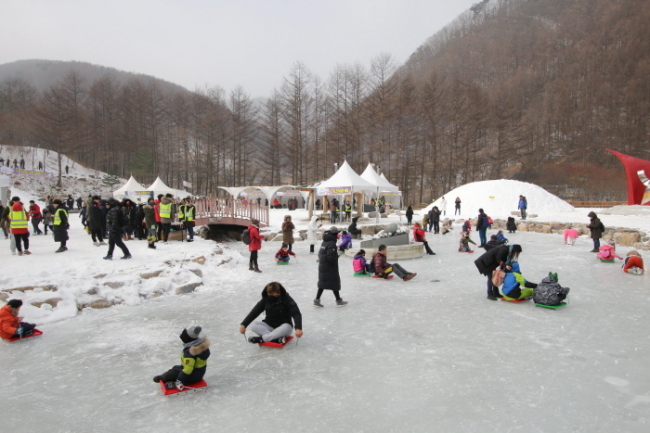 The Pyeongchang Trout Festival takes place during winter in the town of Jinbu-myeon in Pyeongchang-gun, Gangwon Province. 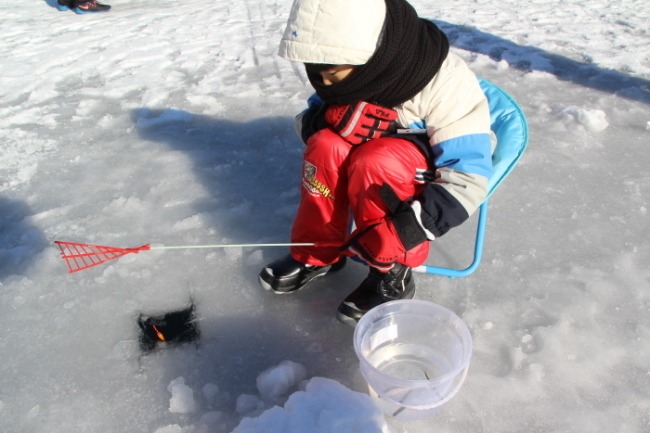 Visitors can enjoy a variety of programs, including ice and lure fishing for trout, snow programs, ice programs and folk programs. There will also be traditional activities, such as sledding and top spinning. Visitors can try out other activities such as riding four-wheel ATVs, snow rafting and sleigh trains. The festival runs until Jan. 27. For more information in Korean, English, Japanese and Chinese, call the travel hotline at 1330. The homepage (festival700.or.kr) is only available in Korean.